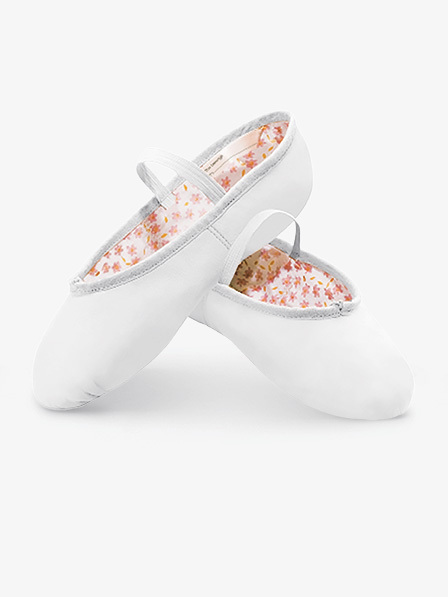 Capezio's "Daisy" is a perfect choice for the beginner. This full sole all-leather upper ballet shoe features an all over dainty cotton daisy print lining, anchored drawstring, along with an inside student ID tag. The Daisy offers functions and superior fit at an excellent price. Pre-sewn single elastic included. Black shoe features a no-print lining. Very comfortable , exactly your true street size woman . Very good stitching , nice leather , bought 2 pair , blk & pnk , couldn't be happier for quality vs. Cost , you get more than what you pay for with these . My daughter just moved into the adult size in this slipper. She has danced in this shoe in the child size for 6 years. The adult size chart is very confusing. I added 2 sizes to her child shoe and ordered a 5.5. It came and was way too big! It looks like it would fit me! I am returning it to order the regular street shoe size. I hope it works. I like that this come is narrow because I still have to pull the strings all the way to get it narrow enough. I bought these on sale once as a backup pair, but I'm kind of surprised how good they turned out to be. I got the 7.5, which is also my street shoe size, and it fits just right. I find them comfortable and the leather is very good quality. However, as with pretty much any full sole slipper, these don't flatter the arch. Mine is a bit high and you can still see it, but it makes my releve look worse and isn't quite as comfortable. I found the back edge to be a little sharp, too, so I sometimes had to put tape or a bandage on my heel so it wouldn't get cut or blistered. Despite all that, I think they're good for beginners. The Discount Dance staff were very helpful in the sizing with my daughter as she is just outgrowing the youth size and moving into women's. I ordered the narrow width as the regular width was way too wide. this was still a bit wide for my daughter's foot (who doesn't have a narrow foot). The toe box area is a bit wide. Just something to consider. Great value for the shoe! Good for little dancers, not older ones! Daisies are great for tiny dancers, but are wide and awkward on feet for anyone over the age of 9 or 10. They run super big. 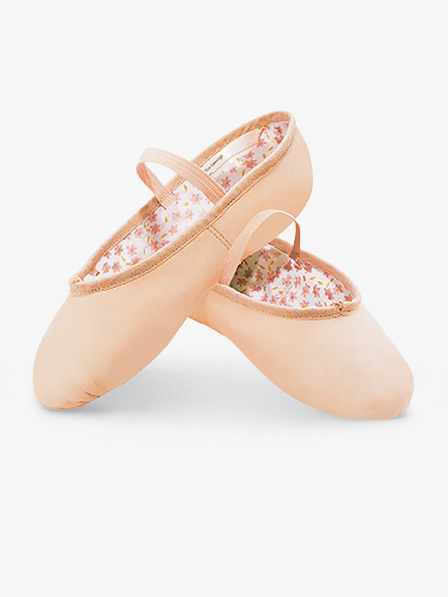 My daughter wears a 7.5 in Capezio Cobras and I ordered an 8 in these but they were absolutely HUGE on her. This site offered a helpful chart that converts child sizes to women's sizes and we found wide width offered as well. These shoes are comfortable and very well made. The soles are more substantial than ballet shoes we tried before. The Capezio brand was recommended by a ballet teacher for their durability and overall comfort. Great product and I was very satisfied with their performance. 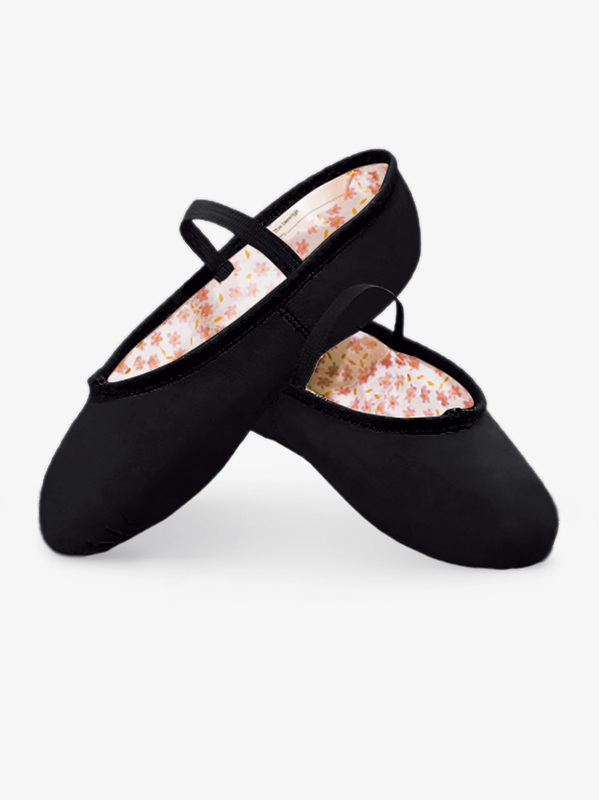 Since I had no experience with Capezio ballet shoes, I relied on the website which said to order your street shoe size. After waiting almost 2 weeks for the shoes to arrive, I was very disappointed to find that they ran about 2 sizes too small! I gave the shoes an average rating overall, as they look very nice and are packaged well, but cannot comment on the comfort or durability since my daughter could not get her foot in to the shoes. These are going back. Overall, these were okay. I got them when I first started ballet about a year and a half ago, and the insole has almost come out completely and holes are beginning to form. The arch doesn't look very good either. I think I'm going to switch to a canvas split-sole shoe. However, I think these were a good beginning shoe and they were inexpensive, but they won't be sufficient for higher levels of dancing. I guess these shoes are OK to start with, but they do not hold well if used in more advanced levels. The insole begins to curl under your toes, making the shoe very uncomfortable. By the time I was finished with these shoes, the whole insole came out, leaving a gooey residue to get stuck to the bottom of my foot. I recommend the Bloch full sole as a cheaper and better quality shoe. I had a pair of these when I first started ballet. I liked them because they were the only ones I ever had. I got another pair of these shoes later on in my dancing life and realized these shoes restict my foot from pointing properly, and encouraged my foot to sickle, which has been a problem for me ever since these shoes. NOT GOOD for beginners�NOT GOOD for ANYBODY! I was unhappy with this shoe. I'm not sure if it was just the pair I received, but one of the shoes completely pulled apart after approximately 11, one hour ballet classes. This shoe was only used in the class. This is the third pair of this same style I have purchased for my daughter. She is happy with the fit and says they feel good to wear. My daughter is 10 and is having quite a growth spurt so we have had to replace with a larger size again. I am very pleased with the price and her dance teacher is happy with the style, it's a win-win for sure. what size would this need to be to fit a mens size 10.5 ? This shoe is fit for women, so men need to order 2 sizes larger than their street shoe size. This shoe is not available in the size you need. Please contact customer service at 1-800-470-1664 for assistance in finding a shoe that will work for you.